Two final days of Cobham village explorations to come this week. Meeting at Shorne at 10am on Weds and Thurs. As with all archaeological projects, geophys is hinting at exciting developments on both Battle St and North Court Field, while Trev and team are unpicking the secrets of Cobhambury house! 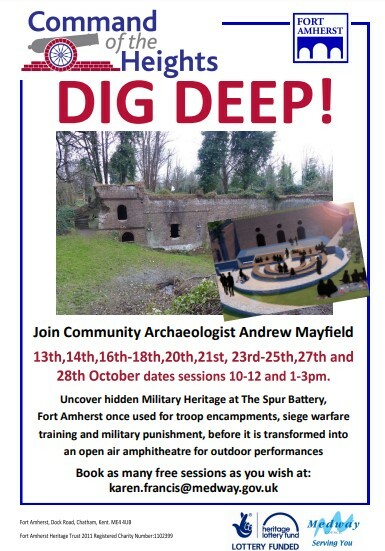 On Friday we will be setting up at Fort Amherst, with fieldwork commencing this Saturday for 2 weeks, including all weekend days and Tues-Thurs week days. See the attached posters for dates and location. We will need to gather before 10am each dig day, at the meeting point on the map. I will go direct to the Fort, but by all means meet at Shorne if easier and car share. 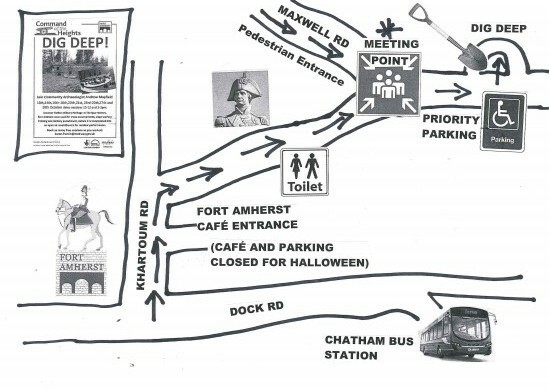 Parking is limited at the Fort, at the meeting point, so people may have to park on Maxwell Road (see map). The Fort is also a construction site this year, so people will need to wear Hi-Vis jackets (provided) and decent footwear, preferably boots. This entry was posted in News & Events and tagged Cobham Landscape Detectives, cobham village, excavation, fort amherst. Bookmark the permalink.